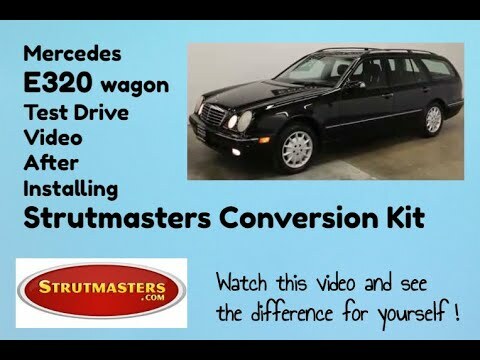 Strutmasters 1998-2002 Mercedes E320 Wagon E320 4Matic Wagon Rear Hydraulic Suspension Conversion Kit is the perfect solution to your air suspension problems. Designed to be very affordable, you can convert your air suspension to use standard shocks/struts and coil springs for less than the price of replacing one air strut. Fits E320 Wagon and E320 4Matic Wagon Models ONLY! 1998-2002 Mercedes E320 Wagon E320 4Matic Wagon Rear Hydraulic Suspension Conversion Kit MH1RB is the perfect solution to your air suspension problems. Designed to be very affordable, you can convert your air suspension to use standard. The air suspension system on the Mercedes E320 Wagon & 4Matic Wagon is made up of assorted parts that must always function in sync. This dependency is expensive and inconvenient. Strutmasters' air to non-air suspension conversion kit gets rid of the faulty air parts for good. The kit, manufactured in America, includes two new cold-wound steel Eibach coil springs with mounts and two passive hydraulic fluid and gas shocks for the rear of the Wagon. Customers love that the kit is installed in about one hour per wheel, thanks to the help of detailed instructions and online installation videos. Each kit comes with Strutmasters' Lifetime Limited Warranty and the expert advice of our ASE certified technicians. Aside from top-notch customer service and excellent quality parts, it's the low price of the kit that convinces most customers to make the switch. The kit is considerably less money than dealership direct replacement or individual aftermarket part replacement. How Do I know If My E320 Wagon & 4MATIC Wagon Air Suspension is failing? If the 98-02 Mercedes E320 Wagon is unable to reach and maintain its proper ride height, a failed or leaking air suspension system may be to blame. Look for these common indicators of a bad suspension system; early detection is the key to avoiding total failure. The most noticeable sign is a sudden uneven height difference between different sides of the Wagon. Typically the front or rear end will sag and the opposite end will remain inflated. These imbalances can wear out the air compressor if they're not fixed in a timely fashion. If the air compressor has already stopped working, an illuminated suspension warning light may be seen on the instrument cluster. At this point, suspension failure is advanced. An expensive repair or direct replacement is necessary. = TOTAL: Over $2,970 (and that doesn‚Äôt even include replacing electronic components that are known to fail such as the height sensors). Choosing the four-wheel air-suspension conversion kit for the 1998-2002 Mercedes E320 Wagon & E320 4Matic Wagon saves YOU over $2,085! 1998-2002 Mercedes E320 Wagon & E320 4Matic Wagon Air/Hydrualic Springs (x2)- Commonly referred to as air bags, a plastic and rubber bag that is fitted on top of the strut that uses pressurized air as a cushion instead of a metal coil spring to hold a vehicle off of the ground and off of its wheels. These are the number one cause of all air suspension leaks. All air springs all go bad at about the same rate. If one is leaking, the others will not be far behind. For a proper repair, all of them need to be replaced at the same time. If your model has hydraulic springs/struts, then it is filled with hydraulic fluid instead of air to adjust the height and dampening of the vehicle. 1998-2002 Mercedes E320 Wagon & E320 4Matic Wagon Electronic Shocks (x2)- shocks whose dampening capabilities are controlled by the suspension control module. 1998-2002 Mercedes E320 Wagon & E320 4Matic Wagon Height Sensors (x4)- a linkage located near each wheel of a vehicle with any electronic suspension that, either mechanically or electronically, constantly measures the height of the vehicle, and reports this information back to the control module so that the computer can identify if changes in height need to be adjusted accordingly. The ride height sensor is a moving part, and like all moving parts, they will eventually wear out. 1998-2002 Mercedes E320 Wagon & E320 4Matic Wagon Suspension Control Module- This vehicle is equipped with a suspension control module. This module is the brain of the suspension system and it reads all of the signals that are being sent by the height sensors and determines if the vehicle needs to be raised or lowered. 1998-2002 Mercedes E320 Wagon & E320 4Matic Wagon O-rings- Although they are the least expensive parts of the air suspension, they are responsible for maintaining the seal where all of the air lines connect. Be sure to replace the O-rings when repairing any air suspension system. Was initially excited and pleased with purchasing the kit for my rear suspension. After my mechanic installed the kit we noticed the ride was very harsh, noisy and didn’t dampen the road. I had my mechanic take apart the interior to check that everything was installed properly and we contacted Rob in customer service. Rob sent a different set of struts but would not assist in the cost for my mechanics labor. I spoke with Ken in customer service and he also insisted that even if the original kit’s struts were defective or the wrong part, he was instructed by his Vice President that Strutmasters would not help pay the cost of reinstalling them. I now longer feel positive towards this company for their inflexible position in this matter. BE ADVISED BEFORE you consider any PURCHASE!